Gluten Free Food Market size was over USD 6.5 billion in 2017 and industry expects consumption at over 830 kilo tons by 2024. Increasing demand for bakery product, baby food, pizza & pasta and cereals should drive gluten free food market size. It helps food maintain its shape by providing moisture and elasticity. It is mainly important for suffers of celiac disease, wheat allergy, and non-celiac sensitivity. Increasing consumer consciousness along with health awareness campaigns with easy access to various beneficial health information is likely to drive the industry growth. It serves various health benefits including lowering body cholesterol level, lose weight and cut down fats, and people suffering from digestive disorders. Change in lifestyle preferences among the Canadians along with consumers interest for gluten free food is likely to stimulate industry growth owing to increase in celiac disease. About 1 in every 133 North Americans has celiac disease where approximately 5% to 10% of these are diagnosed. As per Celiac Disease Foundation, celiac disease is an autoimmune disorder in which foods containing gluten cause the immune system to damage and attack the small intestine. Nearly 30% of Americans try to avoid gluten for fitness reasons and improve overall health performance. Government spending along with increasing gluten free food consumption with prevalence of the disease mainly in China, India, Australia, and New Zealand should drive celiac disease market demand in Asia Pacific region. Government are accelerating various initiatives and mandates for the treatment of the celiac disease where the government could offer various therapeutics at reasonable prices, thereby increasing awareness among consumers with strong focus on the R&D, which in turn may stimulate gluten free food market demand. Gluten free food is widely used in bakery, pizzas, pastas, baby food, and ready meals. Increase in demand for bakery goods owing to properties such as elasticity and stability should industry growth. The most consumed bakery products in Europe constitute biscuits, breads, cakes and pastries. Germany bakery product market was valued at over USD 17.5 billion in 2017. Changing food preferences coupled with low fat and organic baked products are predicted to provide a stimulus to the gluten free food market size. Gluten free bakery products market size was valued at over USD 3.5 billion in 2017. In baked goods, it acts as a vital functional factor as it provides mixing tolerance, gas holding ability, and extensibility to the dough which may enhance product volume & structure. Usage of gluten free bread may reduce the proportion of celiac disease and promotes a healthy digestive tract. These breads are rich in fibre which uses whole rice flour and xanthan gum as common ingredients which in turn maintains freshness of the product, thereby stimulating the product growth. Gluten free baby food market demand may register gains close to 8.5% over the forecast period. Increasing awareness regarding nutritional requirements for growth, development and activity in children have focused on baby’s nourishment, which in turn can prevent the infants from the celiac disease may foster the product demand. Gluten free ready meals market demand may surpass USD 1.5 billion during the forecast period. These are preferred owing to its protein composite which are found in wheat and related grains which includes barley, resulting into increased demand in ready meals products. Increase in working population along with hectic lifestyle should drive gluten free food market size. Conventional store in gluten free food market demand is poised to exceed 6 billion by 2024. Growth of these products owing to various health concerns which includes weight loss and prevention from celiac disease are the factors due to which these are visible in grocery stores. Conventional retailers which include drug, grocery, stores, club stores and mass merchandisers play an active role in gluten free food distribution which may further stimulate market growth. Gluten free food market demand in hotels & restaurants may register significant gains at over 8.5% at the end of projected timeframe. Many restaurants chains offer gluten free menu owing to various allergies with products such as wheat. Many caterers provide allergen information for all the menu they serve which are suitable to eat, thus supporting product demand. E-retailers for gluten free food market demand was estimated 1.7 billion in 2017 and is projected to grow in the foreseeable timeframe. Consumers prefer buying these products online where they get product variety and buying online also reduces product contamination, which will boost the industry growth. North America driven by Mexico, Canada and the U.S. gluten free food market size may register significant growth at over 9.5% up to 2024. Growing concerns towards healthy lifestyle choice rather than medical necessity will accelerate the product demand. These products are perceived as a healthier option as it gives numerous benefits including reduction of bowel syndrome, obesity, schizophrenia and improves mental health conditions and athletic performance, thereby driving regional industry growth. Europe driven by UK, France, Spain and Germany gluten free food market demand may surpass 6.5 billion by 2024. Increasing number of individuals who are being diagnosed with celiac disease is the key factor to boost the industry. People suffering from this disease are deficient in fibre, iron, calcium, vitamin D and vitamin B12 which can be remedied with a daily gluten free multivitamin as it contains all the essential minerals which is required for the treatment of celiac disease, which may foster regional growth. 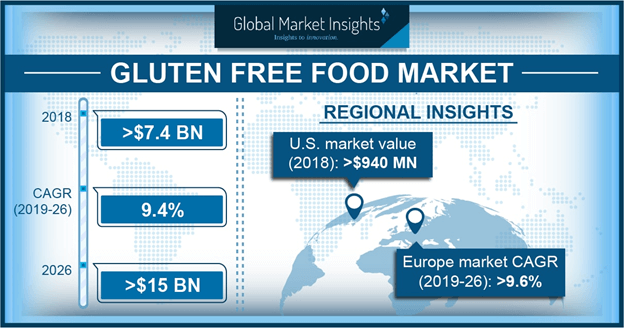 Asia Pacific led by Australia, Japan, India and China gluten free food market demand is likely to register significant gains at over 8.5% by the projected timeframe. Growing concerns towards healthy food diet coupled with increasing awareness of gluten intolerance are the key factors contributing towards market demand. Increasing healthy diet demand from young consumers who seeks low-carbohydrate and nutritional may fuel product demand. 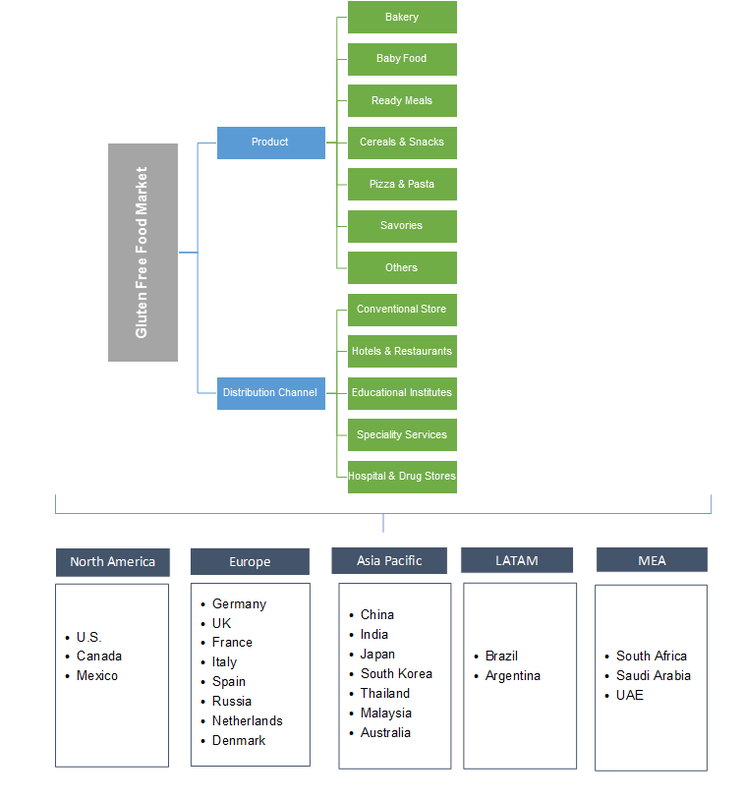 Global gluten free food market share is fairly fragmented with companies such as Boulder Brands, Seitz Glutenfrei, Hain Celestial, General Mills and Kellogg’s. The companies are involved in mergers & acquisitions and joint ventures to expand their product portfolio and brace their global presence. Furthermore, the industrial participants are focusing to produce cost-effective products to boost the overall industry growth. Gluten free food provides a variety of health benefits which includes lowering of cholesterol level, treatment of celiac disease, reducing obesity and allergies which is likely to industry demand. In bakery products, these are used in formulation of bread owing to its rich source of fibre content. Furthermore, these food products are useful for consumers suffering from digestive tract disorders which offers growth prospects in the gluten free food market.